Stephanie is a Friends figure first released in 2012. Stephanie has fourteen variations, all of which have the same face and eleven of which have the same hair. Stephanie has a light nougat head, Stephanie's eyes are light blue in colour. She has curved black eyebrows over each one. She has an open smile showing her teeth, decorated with pink lipstick. Like all of the mini-doll figures, she has a nose. Her regular hairpiece depicts long, straight blonde hair. Her bangs or fringe is swept to the right. There are two holes in her hairpiece one on the top and one on the right to hold bows and other accessories like tiaras and sunglasses. In 3183 Stephanie's Cool Convertible, 30105 Stephanie and mailbox, and 5000245 Stephanie, which seems to be her normal variation, she wears a white shirt at the top showing part of her skin, on the top there are pink stars, hearts and circles, she has light nougat arms and hands. She wears a pink skirt, with light nougat legs with white sneakers, which has pink at the front and pink laces. In 3930 Stephanie's Outdoor Bakery, she wears a white shirt at the top showing part of her skin, at the top. On the top there are pink stars, hearts and circles, she has light nougat arms and hands. She has a lavender skirt, light nougat legs and pink ballet shoes. 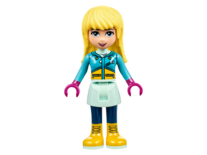 In 3935 Stephanie’s Pet Patrol, she has an aqua jumper, on it there are dark blue spots, and a pink star with a dark blue star inside it, she has aqua arms and light nougat hands, she wears a pink skirt with light nougat legs she wears magenta coloured shoes and anklets. Stephanie had one new variation in the summer of 2012. In 3185 Summer Riding Camp, she wears a white shirt at the top showing part of her skin, on the top there are pink stars, hearts and circles, she has light nougat arms and hands. She wears green jeans with purple butterflies on the side, she has light nougat legs, she wears purple sandals. In 41004 Rehearsal Stage, she wears a white top with one strap, it has purple outline, decorated on the top there are little silver circles, and a purple belt made out of small spaced out rectangles and a purple star in the middle, she has light nougat arms and hands. She wears a lavender skirt with white leggins, she wears magenta coloured shoes and anklets. In 41005 Heartlake High, Stephanie is wearing a white blazer with black outlining and golden buttons, underneath she wears a purple shirt, she has white sleeves and light nougat hands. She wears a dark purple skirt over her light nougat legs which lead down to her dark pink shoes. In 41011 Stephanie's Soccer Practice, she wears a white jersey, it has blue at the top, the blue is outlined by purple, on the right there is a white seven, with purple outline and there are light blue curls around it, she has short light blue sleeves, the rest of her arms are light nougat, her hands are also light nougat. She wears long dark blue jeans, with light nougat legs, and white sneakers, with dark blue at front and light blue laces. In 41016 Friends Advent Calendar, Stephanie is wearing her winter clothing. She wears a lavender jumper, with white buttons on the right. Over her jumper there is a printed pale blue scarf. Stephanie has lavender sleeves and light nougat hands. Stephanie wears a pale blue skirt, white leggins and blue boots with white laces. In 41029 Stephanie's Newborn Lamb Stephanie wears a white sleeveless jumper with lavender perpendicular lines. Underneath she wears a lavender sleeveless shirt. She wears a dark purple skirt over her light nougat legs which lead down to her dark pink shoes. In 41037 Stephanie's Beach House Stephanie has a new hairpiece: it is in a ponytail and has bangs or a fringe at the front. She wears a light pink sun visor in her hair. She is wearing a sand green sleeveless top with a white stripes. It has a white brim around the neckline and magenta flowers and dolphins at the side. She wears a magenta towel which is tied around her waist and top of her legs. The rest of her legs are light nougat leading down to her navy flip flops. In 41057 Heartlake Horse Show Stephanie wears riding suit consisting of a long-sleeved turquoise top, white a white collar printed on the front. She wears long white trousers and black boots. Her hairpiece can be interchanged with a riding helmet with blond ponytail. In 30113 Stephanie's Bakery Stand, she is seen in a sand green sleeveless top with a white brim around the neckline and flower motif printed on. It is combined with her magenta layered skirt and white sneakers with magenta soles and shoe laces. Her torso piece is the same as her friend's in 41027 Mia's Lemonade Stand. Both of Stephanie's summer 2014 varations feature her ponytail and sun visor combo piece. In 41058 Heartlake Shopping Mall Stephanie is wearing a earth blue halter top, the top of the top is white. The top has light pink flowers decorating it. Around her neck she wears a sliver necklace. Stephanie wears a magenta layered skirt and white sneakers with magenta soles and shoe laces. In 41092 Stephanie's Pizzeria Stephanie will once again wear her regular top, she wears a white shirt at the top showing part of her skin, at the top. On the top there are pink stars, hearts and circles, she has light nougat arms and hands. She wears shorts with it, in pink. Her light nougat legs come down from her short to her magenta sandals. In 41094 Heartlake Lighthouse Stephanie reuses her sand green sleeveless top with a white stripes. It has a white brim around the neckline and magenta flowers and dolphins at the side. Stephanie wears a lavender towel rapped around her legs, which lead down to her azure flip flops. She once again wears her sun-visor in 30204 Wish Fountain. Her outfit portrays her wearing a light purple halter top and medium lilac skirt. The top of the top is outlined in bright reddish violet, the right corner also has bright reddish violet outlined flowers, a palm tree and a wave. She wears a short triangular medium lilac skirt. On her feet she wears medium lilac and magenta striped shoes. In 41101 Heartlake Grand Hotel, her torso is light nougat, but she has a Bright Yellowish Green bikini top with a white outline in the centre of the torso. She also wears a bright reddish violet and white lei. She wears a bright reddish violet towel which is tied around her waist and the top of her legs. She also wears dark blue flip flops. In 41106 Pop Star Tour Bus, she wears a white right strap top. The top has diagonal lustrous sliver stripes coming down from the strap, with lustrous sliver sparkles and stars between the stripes. She combines it with a bright reddish violet skirt and white sneakers that have bright reddish violet at the front and bright reddish violet laces. In 41109 Heartlake City Airport, Stephanie wears an aqua top with a bright reddish violet trimming around the neckline, and at the end of the neckline, there is a blue flower. She wears it with her regular magenta skirt and white sneakers with magenta laces. She also comes with transparent earth blue sunglasses. She is very similar to her appearance in In 3183 Stephanie's Cool Convertible, 30105 Stephanie and mailbox, and 5000245 Stephanie, except she has brown eyebrows instead of black. Stephanie is one of the five main characters in the Friends theme. She is the social girl of the group. Stephanie has four best friends, Andrea, Emma, Mia (who according to Ultimate Sticker Collection: LEGO Friends and Brickmaster Friends, is her cousin) and Olivia. Stephanie is also friends with Andrew, Christina, Chloe, Ella, Katharina, Jacob and Maya. Stephanie appears to be dating Matthew or has a crush on him. Stephanie owns two pets, a dog, Coco, and a rabbit, Daisy. They are respectively included in 3183 Stephanie's Cool Convertible and 3935 Stephanie’s Pet Patrol. Stephanie likes soccer, and she plays for her school, Heartlake High's soccer team. She also has an interest in baking, as shown in 3930 Stephanie's Outdoor Bakery. She also likes planning, organizing, talking to people, and parties. Stephanie's personality is curious and friendly, somtimes her friends thinks she can be a bit controlling. Stephanie is first shown making some cupcakes, Olivia's dog Scarlett bumps into her making her to drop all the cupcakes, Olivia apologizes to the Stephanie and the girls about Scarlett and they become friends. Stephanie also enters the World Petacular, she helps Olivia enter Scarlett in the dog competition, and Andrea helps Stephanie enter in the baking contest, Stephanie wins first prize for her cupcakes. This is a description taken from LEGO.com. Please do not modify it. (visit this item's product page) Favorite animal: My bunny, Daisy, and my dog, Coco. I love: Planning, organizing, talking to people, playing soccer, parties! I’m also good at: Writing stories. I want to be: A journalist, an editor or a party planner. I would never: Miss my friends’ birthdays or burn my cup cakes. I like to hang out: My outdoor kitchen, my car, anywhere I can help plan fun events! She appears in more sets than any other mini-doll figure. She is the only Friends character to have more than one love interest, the two being Nate and Matthew. Favorite animal: My bunny, Daisy, and my dog, Coco. This page was last edited on 16 June 2017, at 04:28.